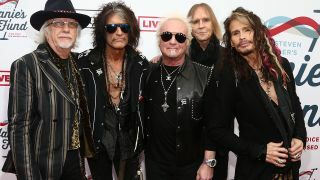 Aerosmith kicked off their Las Vegas residency in style on Saturday night with a 16-song set. The band released a behind-the-scenes clip on Friday showing them preparing for the 34-date stay at the Park Theater at the new Park MGM resort – and now they’ve released official footage from the event. They started the set with Train Kept ‘A-Rollin, before launching into tracks including Mama Kin, Sweet Emotion, Cryin’, Livin’ On The Edge, Love In An Elevator, Toys In The Attic, Dude (Looks Like A Lady), Dream On and Walk This Way (full set below). Fan-filmed footage from Saturday night’s performance has also emerged online and can be found below, along with Aerosmith’s own clip. Tickets are available from the official Aerosmith website.